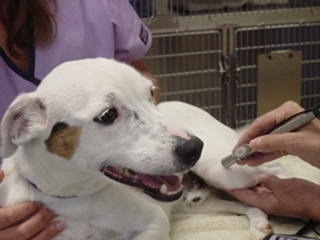 Laser Therapy significantly reduces the swelling and pain in soft as well as bony tissue. This is exciting technology that our clinic offers to our patients. No anesthesia or shaving is required. We pass a laser beam across the area of treatment. The energy transmitted by the various wavelengths in the beam stimulates healing in the treated tissue and is very soothing to your pet. For more chronic pain (e.g. osteoarthritis) pets may require multiple treatments before seeing significant improvement in mobility and pain reduction. For more acute pain or swelling, improvement is usually noted within 24 hours. With any therapy, the patient should be kept quiet until all treatments are completed.